With new theatre, it is sometimes tricky to differentiate between what comes from the original writing and from the production you are viewing. After all, such an early incarnation of a musical will have very few, if any, comparisons by which the production itself can be directly judged. 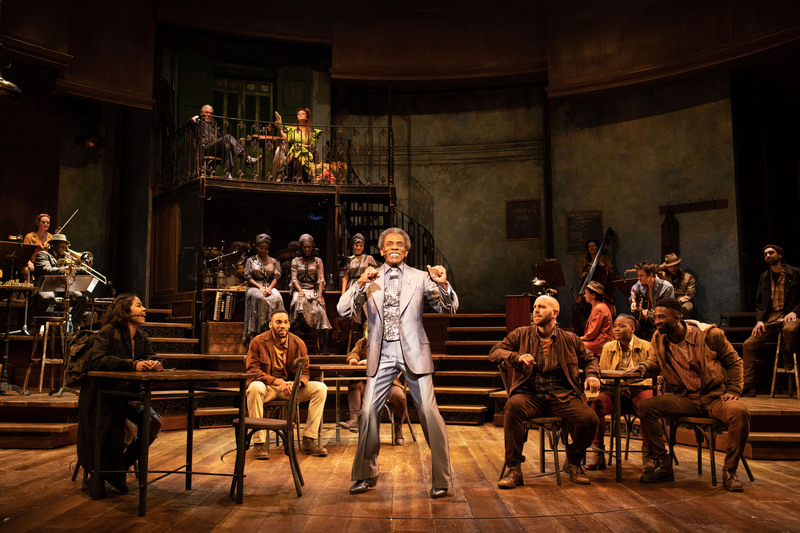 With Hadestown, the two are even more entwined given that director, Rachel Chavkin, also has a credit for devolving Anaïs Mitchell’s folk-rock musical. This being said, Hadestown at the National Theatre feels like a fantastic production of a promising but problematic musical. From entering the auditorium it is evident that the production values invested into this show are going to be of a high standard. Everything just looks good. Rachel Hauck’s rustic, industrial and overbearing set is filled with detail but never feels cluttered. Its multiple revolves and pit are utilised stylishly never looking anything close to a gimmick, and the browns and grey complement Michael Krass’s beautiful costume design appropriately. Chavkin’s direction is also a triumph, with the way she sends her cast around different parts stage making it feel like another world (or at least a town!). David Neumann’s choreography, is filled with passion and character, never strict but fluid and raw, feeling relevant to the characters and action. While I was blown away by the staging (and haven’t even got onto the performances yet! ), I do have some issues with the writing. Based on the Greek tragedy of Orpheus and Eurydice, the narrative seems a little dense and in need of pruning. It also struggles with how seriously to take itself. It handles the balance between mythology and reality very well, but with the main plot relying on Orpheus singing for the freedom of Eurydice, things do edge on the corny side. This makes it more difficult to become invested in the trials of the protagonists, though I must confess that the end sequence when Orpheus and Eurydice return from Hadestown had me gripped to my seat with all the tension it built. While there is a little too much repetition, by and large, Anaïs Mitchell has written an accomplished and impressive score. The musical is largely sung-through, and the parts that are not, are poetic in themselves. Given she also wrote both the book and the lyrics as well as the music, it is noticeable how well all three go together, and Mitchell’s music goes a long way to building the drama in some of the bigger numbers. “Wait for Me” and “Why We Build the Wall” (the latter being a not so subtle nod towards certain current politics) are particularly epic. The song that has stayed with me, however, is the much more reserved, but wonderfully melodic, “All I’ve Ever Known”. The fact that it is sang by the irresistible Eva Noblezada, who must be one of the best young talents musical theatre, only emphasised how beautiful this melody is. As Eurydice, Noblezada portrays curiosity, naivety, passion and fear in the subtlest of facial gestures. Her acting seems effortless in the way she is able to say so much by doing so little. The other actor I could watch all day is André De Shields who played Hermes, essentially acting as narrator. De Shields is coolness personified. He commands the stage, not rushing anything, but keeping the whole audience fixed on every word and movement. There is less depth to Reeve Carney’s Orpheus, that is played as a rather typical “dreamer musician with a guitar” leading man. He undoubtedly has a powerful set of pipes though, pulling off a difficult sing with his pleasing falsetto. Amber Gray and Patrick Page complete the leading cast as Perephone and Hades, the former playing the goddess as erratic and unhinged and the latter as a firm businessman (with a satisfying bass voice). The whole show is sang impressively, with leads and chorus alike blending with a lovely tone. There is so much to like about Hadestown and it is difficult not to sit back and just applaud how well all the components of this production have come together. It’s still not the finished article, but is definitely worthy of its run at the National and has signs of something really great.